In March, 2013, this Second Printing replaced the First Printing, originally published in September, 2012. 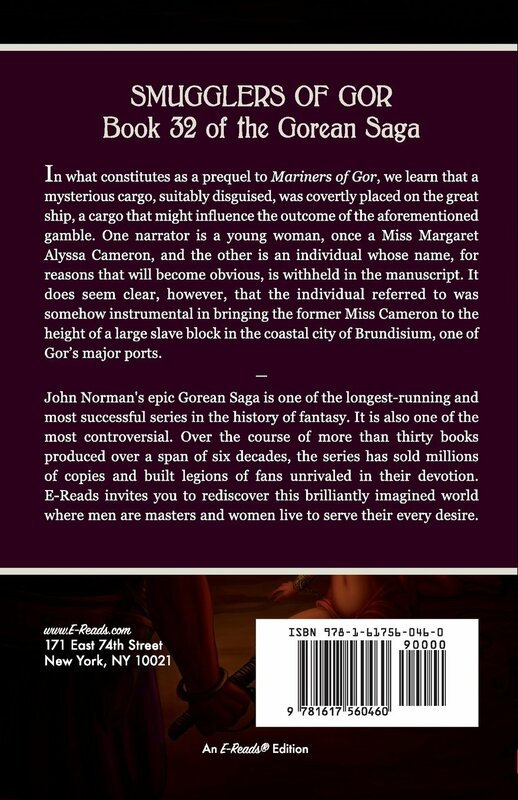 In what constitutes as a prequel to MARINERS OF GOR, we learn that a mysterious cargo, suitably disguised, was covertly placed on the great ship, a cargo that might influence the outcome of the aforementioned gamble. One narrator is a young woman, once a Miss Margaret Alyssa Cameron, and the other is an individual whose name, for reasons that will become obvious, is withheld in the manuscript. It does seem clear, however, that the individual referred to was somehow instrumental in bringing the former Miss Cameron to the height of a large slave block in the coastal city of Brundisium, one of Gor's major ports.